When I was in High School I used to carry around blotting papers. While reading a fashion magazine I came across an advertisement for them and couldn’t for the LIFE OF ME remember why I stopped. How silly! They work and they don’t mess up your make up when in use. The current brand that caught my eye is ‘Boscia’ available at Sephora for $10. 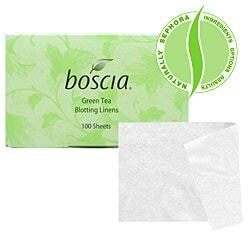 Boscia Fresh Blotting Linens absorb excess oil and banish shine without disturbing your makeup. These 100% natural linen, preservative-free facial blotting papers will keep you looking matte and lovely, all day long. Their compact holder slips easily into your purse, pocket, or desk drawer. I like these blotting papers. I buy them when they’re on sale at sephora.com – they’re only $5 for 100.